The second issue of our sister publication, Tees Life, is now available to read online. In what is only the second edition of Teesside’s only lifestyle magazine, which was launched in April this year, publishers Resolution Media and Publishing have already expanded Tees Life to accommodate an obvious demand from businesses across the Teesside region. And circulation has also increased – with 7,000 copies being distributed across Teesside from Friday. Following on from a hugely-successful launch of the magazine, the second issue features interviews with legendary Paralympian Tanni Grey-Thompson, new Tees Valley Mayor Ben Houchen and former Boro player Craig Hignett. There’s also a range of exclusive editorial content covering food and drink, fashion, motoring and sport, people and places, homes and interiors, advice and events. 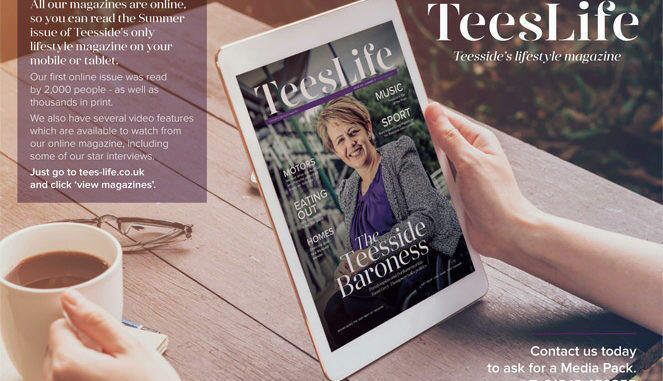 Tees Life is published quarterly, now with a 20,000+ readership, and circulated to homes, pubs, restaurants, hotels and salons across Teesside including Wynyard, Eaglescliﬀe, Yarm, Ingleby Barwick, Wolviston, Hartburn, Nunthorpe, Marton and Guisborough. It launched with 44 pages – but the Summer issue has eight more, with 52 pages made up of less than 40% advertising and more than 60% editorial content for readers to enjoy, free of charge. The second issue also includes some additional video content. Click here to read the Summer issue of Tees Life.